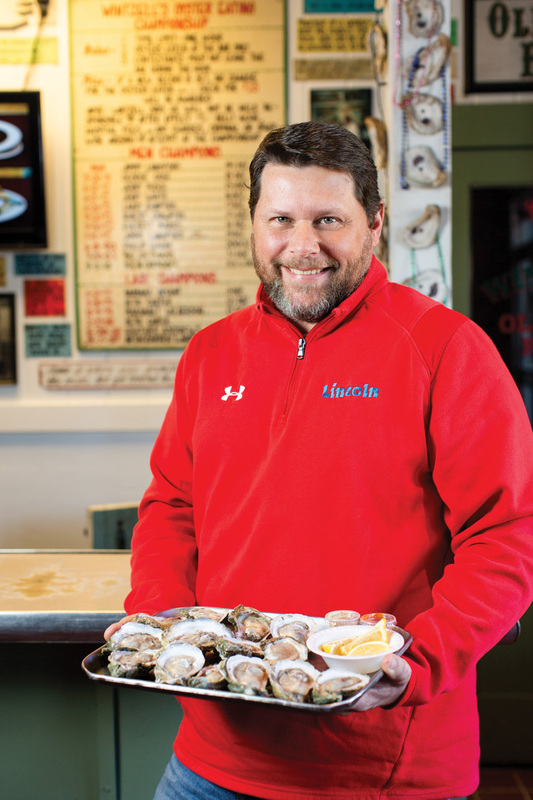 Almost a decade later, the humble, reigning oyster-eating champ recalls downing heaps of bivalves at Wintzell’s. The sign says it all: “Wintzell’s Oyster-eating Champions.” For on this board of honor at Wintzell’s Oyster House’s 605 Dauphin Street flagship eatery are the names of winners. They are the few, the proud, the oyster-eaters. But after gulping 30-plus oysters, most contestants give up and exit the building — sometimes very fast. But not Ken Orndoff. A Gulf Shores resident, Ken is the current champion. “This place brings back good memories,” the master of mollusks says, standing at the bar while gazing upon the sign that proclaims his record. Ken ate 421 raw oysters within one hour. Devoted wife Wendy looked at the man she loves and very sweetly replied, “I think you’re crazy.” Game on. After calling ahead, Team Ken entered Wintzell’s on Sept. 11, 2010. “Let’s do it,” he said, as bar attendees shucked several starter trays of naked crustaceans. The bar attendee shucked oyster after oyster to meet Ken’s demand. Friends, Wintzell’s customers and staff gathered around the bar, cheering him to victory — and then it happened. Ken ate 399 oysters in 6 minutes and, for some unknown reason, got sick. Let us just say that a multitude of previously eaten oysters received a second chance, involuntarily recycled into a nearby clean garbage container. Not wanting to be disqualified, he pointed at the vessel holding remnants of second-chance shellfish digested no more, and asked judges, “If I can eat that, does it count?” The ruling was, “Yes.” The contents were scooped into a water glass and swallowed yet again. Commenting on Ken’s success, Omainsky noted, “I have been with Wintzell’s officially about six years. In that time, only a few have attempted to break Ken’s record.” None successfully. For those who break the record, Wintzell’s pays for oysters consumed and awards a $25 check. As for Ken? “It was fun, but I doubt I would do it again if my record is broken,” he laughs. Upon winning the title, he celebrated the next day by revisiting Wintzell’s Oyster House and ordering a plate of — you guessed it — raw oysters. Oysters must be raw and prepared on-site at Wintzell’s. All oysters must be eaten at Wintzell’s bar. All oysters must be eaten within 60 minutes. The contest recognizes Overall Champion, Men’s Champion and Lady’s Champion (currently Beth Carter Larrimore at 215).